Salami is ridiculously delicious. This cured, spiced sausage is loved by many people. Even though salami is not exactly the healthiest food choice that you can make, considering the high amounts of calorie, fat, and sodium, salami is still many people’s favorite. However, salami is not entirely bad because it is also a good source of vitamin B12, vitamin B3, and vitamin B2, all of which are needed by the body. 2 What is Hard Salami? 3 What is Dry Salami? Salami is actually a type of cured sausage that is made from fermented and air-dried meat. Usually, beef and pork are used, though different countries and regions may use other types of meat. Historically, salami first appeared in southern and central European countries, where it was popular among peasants because of its incredibly long shelf life. Once cut, salami can be stored at the room temperature for up to 40 days. Such incredible shelf life ensures enough meat in a place with a meager or inconsistent fresh meat supply. 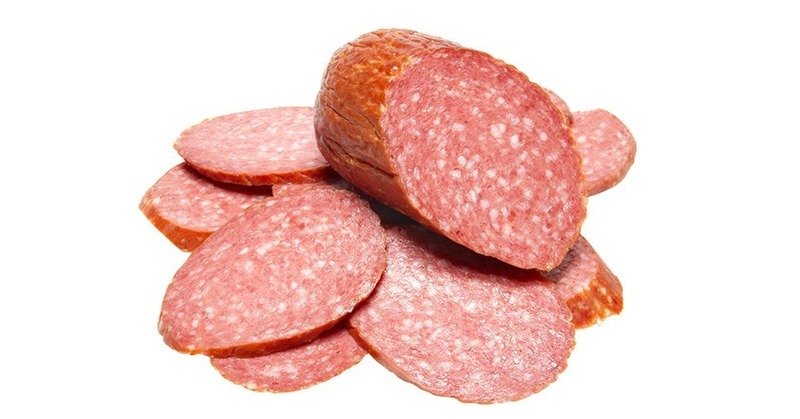 Salami is very high in calorie, fat, and sodium. A 100 g serving of salami averagely contains 441 calories, which is equivalent to 22% of the allowable calories in a 2,000-calorie daily diet. A serving of salami also averagely contains 41 g fat, which is quite significant in comparison with the recommended daily limit, which is between 44 g to 78 g. There is at least 80 mg cholesterol, where the daily limit is usually 300 mg. And there is at least 1890 mg sodium. That is a very high number, able to elevate your blood pressure and cause water retention. A healthy person should limit their sodium intake to 2300 mg per day, whereas a person with a heart or cardiovascular problem should avoid more than 1500 mg sodium per day. Salami is so poor in carbohydrate, so you should pair it with a healthy source of carbohydrate. It is, however, a good source of protein; each serving of it has about 17 g protein. The daily protein requirement is usually between 46 g to 56 g. Salami also contains good vitamins and minerals, notably vitamin B12, vitamin B3, vitamin B2, phosphorus, zinc, iron, and potassium. Hard salami is actually a variation of Genoa salami, an American variety salami that is commonly (but falsely) thought to originate in Genoa. Genoa salami is made using beef, pork, or the combination of the two, and then seasoned with black peppercorns. Some types of salami are put in a damp container before the drying process in order to build the microorganisms that cure the meat. Genoa salami is one of them. The distinctive character of Genoa salami is that it can be very delicate. Hard salami differs from Genoa salami because it can contain additional herbs and spices, such as garlic and white peppercorns, or even red or white wine. In addition, it is also drier and sometimes harder. Thus, it can be very chewy. But the grains of Genoa salami and hard salami are usually similar. 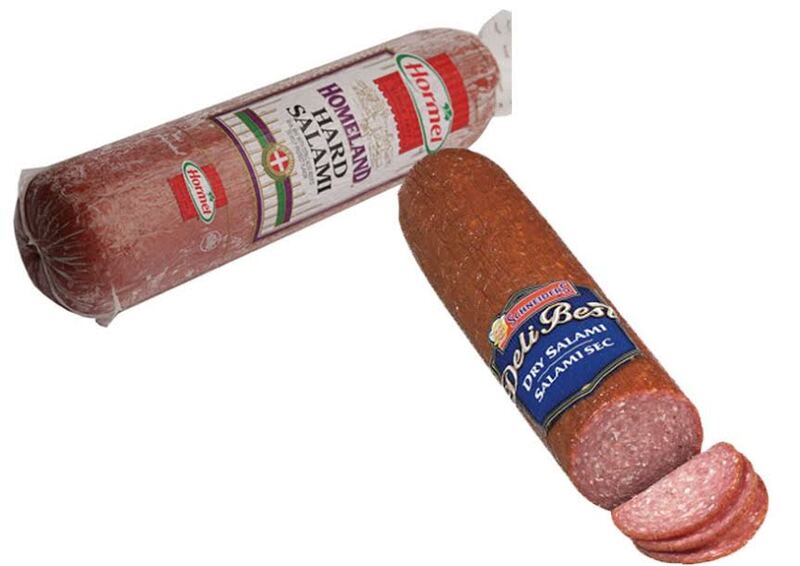 Compared to Genoa salami, hard salami has a better shelf life. It does not need refrigeration and can be stored in the room temperature. So, it can be a feasible meat solution for a place without any refrigeration facility or if your refrigerator is currently broken. This is mainly because of the drier nature; with the lower water activity, microbes are much more difficult to grow and reproduce. Dry salami usually refers to Soppressata, which is Italian dry salami. There are many variations that can be categorized into two types: a cured dry sausage that is typical of Apulia, Basilicata, and Calabira, and an uncured salame that is typical of Tuscany and Liguaria. Soppressata is a part of the southern Italian cultural heritage. Such dry salami is made using pork and ham. Some varieties of dry salami can have a very fiery taste, so be careful when choosing. As mentioned above, hard salami is usually made using beef, pork, or both. On the other hand, dry salami is usually made using pork and ham. So, if you prefer to eat something halal, you should stay away from dry salami and choose beef-based hard salami. You may want to check the product’s label first before purchasing. Texture-wise, hard salami and dry salami can be quite similar to each other. 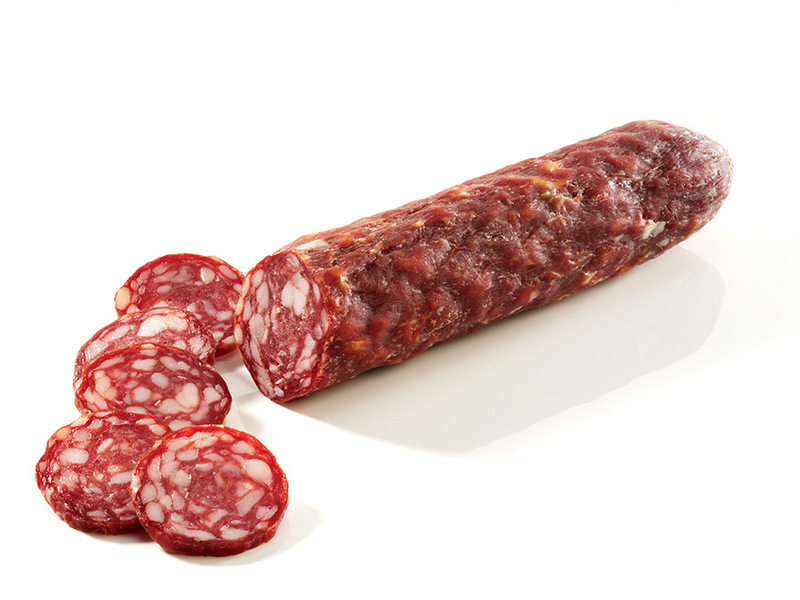 They are both dry and somewhat hard, though there are some varieties of hard salami that can be extremely chewy. Dry salami usually doesn’t get extremely chewy. You can also distinguish the two types of salami by the fat distribution. They have very different fat distribution. Hard salami would come with fat that is conveyed in many smaller pieces that spread across the entire surface. On the other hand, the fat in dry salami is distinctively concentrated into bigger pieces that are less disseminated. Often you will find the majority of the fat in dry salami to be accumulated in central white blocks. Salami is a type of cured sausage made from fermented and air-dried meat. Hard salami and dry salami are two popular types of salami. Hard salami is a drier and sometimes harder variation of Genoa salami, which is actually American type salami. Hard salami is made using beef, pork, or both. You can identify hard salami by the many small pieces of fat scattered across the surface. On the other hand, dry salami usually refers to Soppressata, which is Italian type dry salami. Dry salami is made using pork and ham. You can distinguish dry salami by the concentrated, less disseminated blocks of fat in the center.